Our green houmous is made with petit pois and broad beans for a fresher flavour. Sprinkle over the smoked almond dukkah for extra crunch and serve with crispy flatbreads. Bring a pan of water to the boil and cook the broad beans for 4 minutes or until tender. Remove with a slotted spoon and refresh under cold water, then nick the skin on the side of each bean with your fingernail and pop out the bright green bean within (discard the skins). Put the beans and peas in the bowl of a food processor. Add the chickpeas, tahini, garlic, lemon zest and juice and whizz to a thick paste. Add 2-3 tbsp water to loosen, if you think it needs it. Season. Heat the oven to 220°C/200°C fan/gas 7. Brush the flatbreads with a little oil and season well. Spread out on a baking sheet and bake for 8-10 minutes, turning once, until crisp. For the dukkah, put all the ingredients in a large frying pan over a medium heat and toast, stirring occasionally, until lightly coloured and fragrant. Set aside to cool. 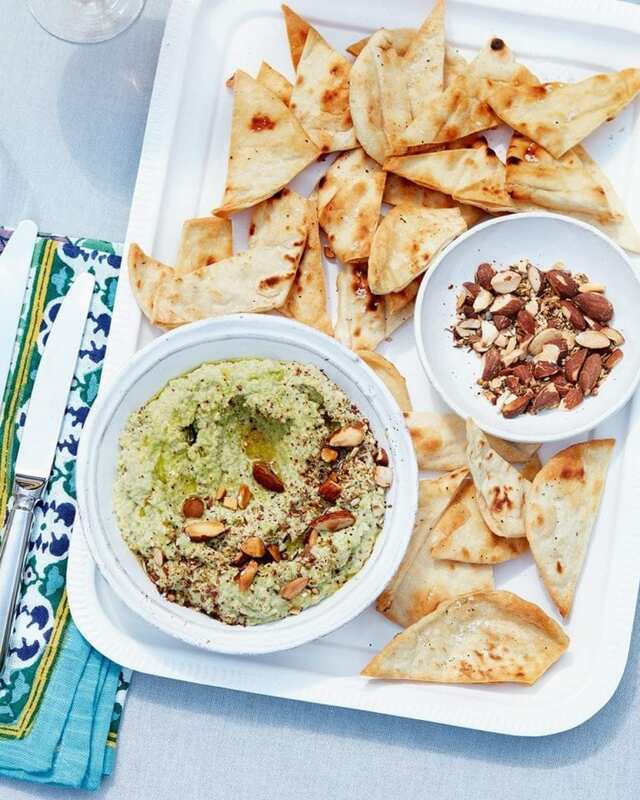 Serve the houmous topped with dukkah and olive oil, with flatbreads and extra dukkah on the side. Make to the end of step 4. The houmous and dukkah will keep for up to 24 hours in separate airtight containers in the fridge.